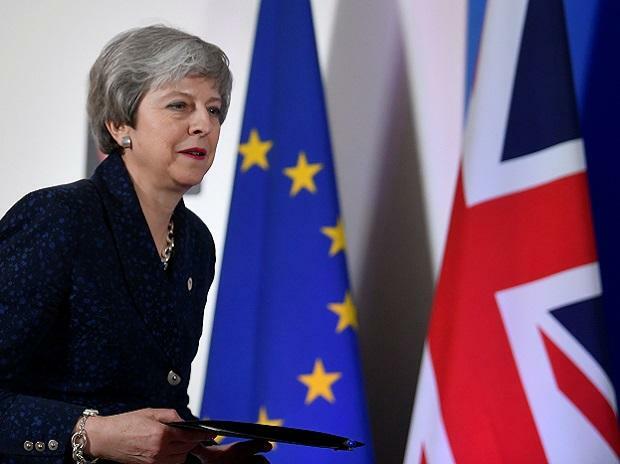 British Prime Minister Theresa May said Tuesday she will seek another "short" extension of Brexit in order to pass the deal she agreed with the European Union. May came out of seven hours of crunch talks with her ministers and also offered to meet opposition Labour Party leader Jeremy Corbyn for negotiation on a joint approach that could break the current impasse in parliament. "Leaving with a deal is the best solution," May said from her Downing Street office in nationally-televised remarks. "We will need a further extension to Article 50, one that is as short as possible, and which ends when we pass a deal," she said. Article 50 is the withdrawal notice May sent to Brussels in March 2017. EU leaders have agreed to extend the original March 29 Brexit deadline until April 12 to avoid a chaotic "no-deal" ending to the 46-year EU-UK partnership. May stressed that the 27 EU leaders would need to know why Brexit should be pushed back again before approving her request, which needs unanimous support. "We need to be clear what such an extension is for to ensure we leave in a timely and orderly way," she said. "This debate, this division, cannot drag on much longer." May said she wanted to meet Corbyn "to try to agree a plan -- that we would both stick to -- to ensure that we leave the European Union and that we do so with a deal". There was no immediate response to her comments from the Labour leader. The House of Commons has rejected May's divorce deal with Brussels three times and is currently trying to come up with an alternative way forward. Its two initial attempts to reach a consensus on a Plan B have failed.